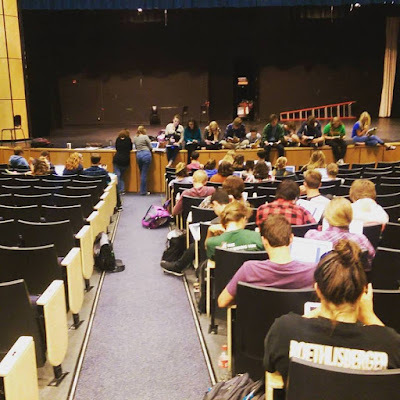 The first rehearsal for Noises Off. The fall production of the Highlands Theatre Departments has been announced. Noises Off, gives the audience a funny peak behind the curtain about what it's like to make a theatre production. Michael Frayn's Noises Off takes a fond look at the follies of theatre folk, whose susceptibility to out-of-control egos, memory loss, and off-stage drama turn every performance into a high-risk adventure. This play-within-a-play captures a touring theatre troupe in three stages: a dress rehearsal, an opening performance and a performance towards the end of a debilitating run. The show gives a window into the inner workings of theatre behind the scenes, progressing from flubbed lines and missed cues in the dress rehearsal to mounting friction between cast members in the final performance. Brimming with slapstick comedy, Noises Off is a delightful backstage farce, complete with slamming doors, falling trousers, and - of course - flying sardines! The performances will take place at the Performing Arts Center at Highlands High School. Tickets are $8 for students and $10 for adults and are reserved seating only.